Do email popups really work? Back in 2012, one of AWeber’s customers experimented with a lightbox popup. Her results? +1,375% email subscribers. More recently, Omnisend did the same kind of experiment with one of their clients. They increased signups by +150%. Jane Friedman, a blogger, was able to double the size of her email list with an exit email popup. But all email subscription popups are not created equal. Your design, your targeting or the offer you select dramatically impact the number of emails that you’ll end up collecting. And there’s a huge difference between a good popup and a bad one. Today I’d like to share what I’ve learned working with hundreds of top brands on their list-building strategy. No complex words, just simple techniques you can copy and apply right away. Let’s create the best email popup for your website! Signup popups are often criticized. So before creating one, let’s briefly review why they’re useful in the first place, and what kind of results you can expect. Why Create an Email Popup? Let’s start at the beginning. Why popups? First, because popups give your signup forms a huge increase in visibility. Heatmap analysis shows that most web users never scroll down to the bottom of a web page. And guess where most marketers embed their email subscription form? That’s right, in the footer. Adding a popup helps you make your signup form unmissable. Second, because popups come with a lot of targeting and segmentation options. These options allow you to push targeted messages and offers that vastly increase your chances that your visitors will join your email list. Lastly, since popups are not embedded in your website but displayed on top of your content, they offer a lot of flexibility in terms of design. And yes, more creativity often means more leads! 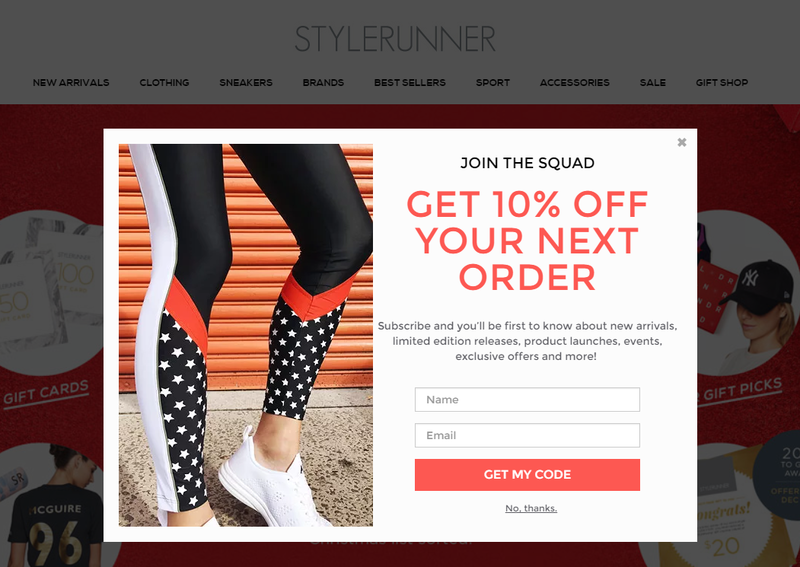 What Is a Good Conversion Rate for an Email Capture Popup? Yes, popups do work. To know exactly how much they do, we analyzed the results of our 50 largest ecommerce clients. The results? The average conversion rate of their email capture popups was 3.75%. 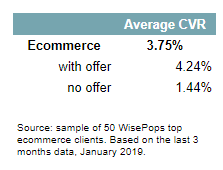 The main difference between the top performing and the lowest performing clients was the inclusion (or non-inclusion) of an offer (we’ll come back to this later in the article). Convinced? Let’s now discuss how to craft the best email popup ever. What Is the Best Timing for an Email Signup Popup? Here’s one of the AB tests created by a high-end hi-fi retailer. They tried displaying the same exact popup on landing and after 2 pages. The popup displayed on landing ended up collecting twice as many emails as the one displayed after 2 pages. 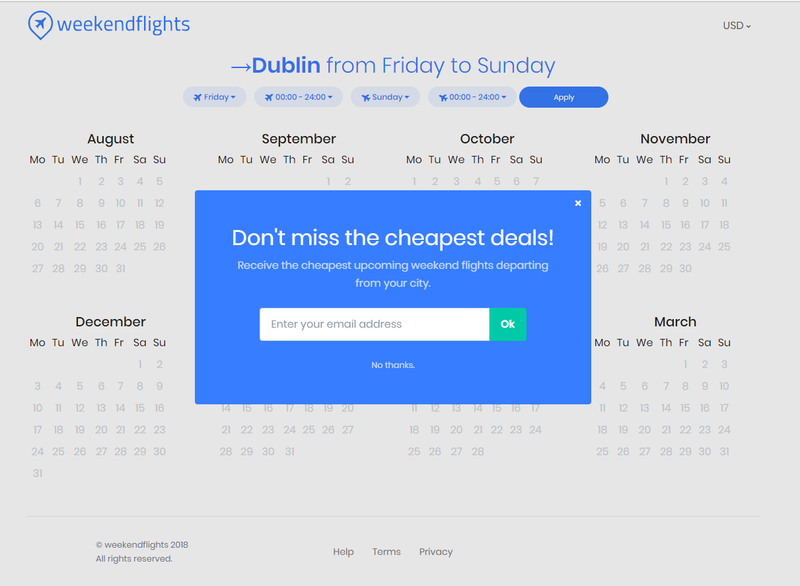 But the conversion rate of the popup displayed after 2 pages was twice the one of the form displayed on landing. All in all, these tests show that the shorter the delay, the more emails you’ll end up collecting. 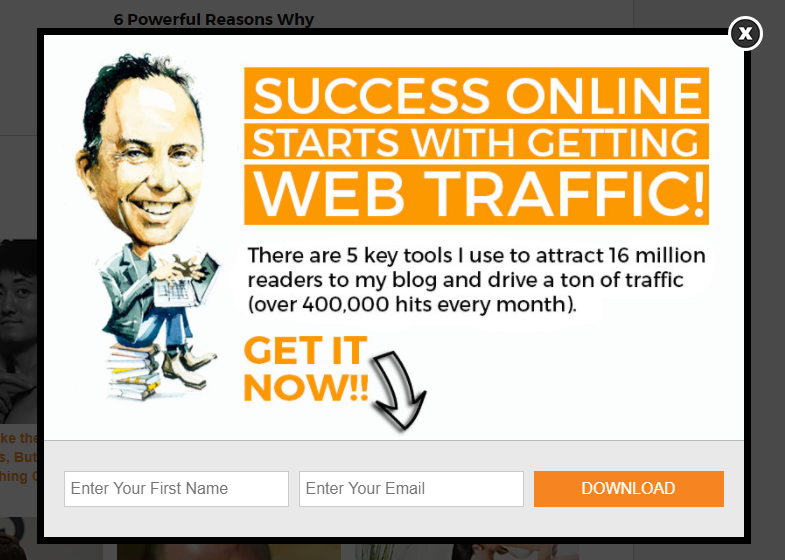 But, as the conversion rate of your popup will be lower, it means you risk annoying a larger portion of your visitors. How Do You Find the Sweet Spot? The best way to identify the exact timing that maximizes the conversions while reaching a reasonable conversion rate is to run an AB test. You can test displaying your popups on landing, after 10 seconds, 20 seconds, etc. If you don’t want to choose, you can also trigger your popup when your users are about to leave your website using exit-intent detection. 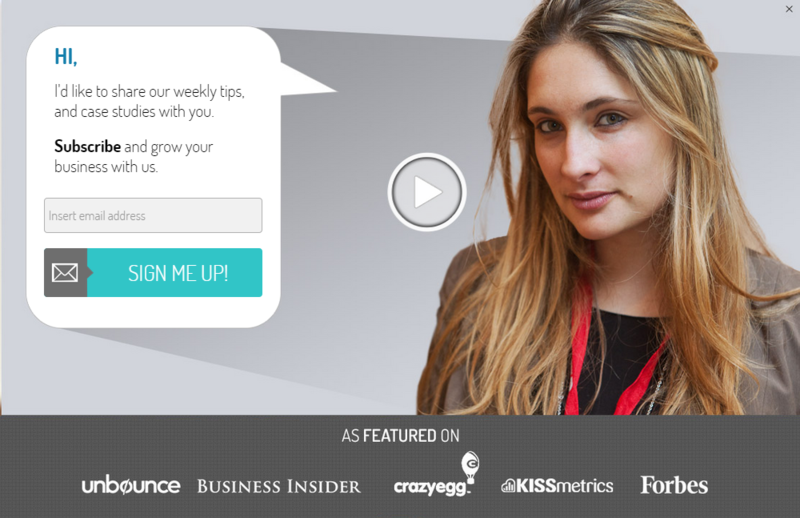 To maximize your conversions, it’s important to design popups that speak to your visitors. To do so, the easiest method is to segment your audience and create a specific popup for each of your segments. Here’s a quick presentation of the two most popular segmentation methods. When using this method, marketers adapt their popups to the page (or page category) that the user is browsing. This way, the popup copy and design are directly correlated to what the users see. Here’s a real-life example on SohoHome’s website. 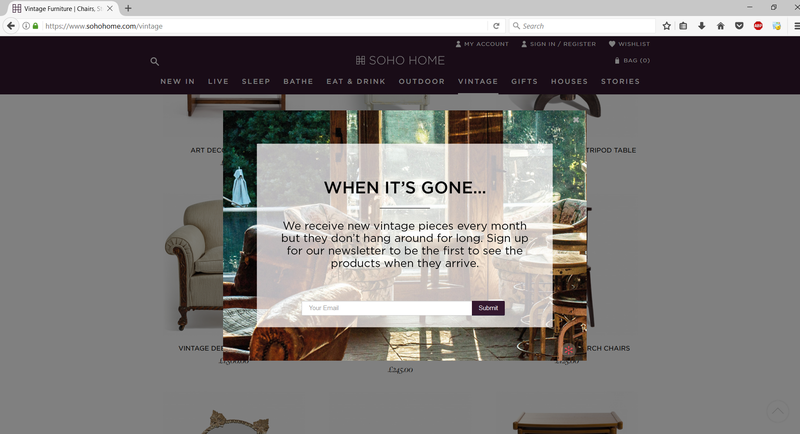 They identified a specific segment – users interested in vintage furniture – and crafted a dedicated popup displayed only in the vintage category. The second most popular way to segment campaigns is by visit count. A lot of our customers choose to create specific popups for new and returning visitors. 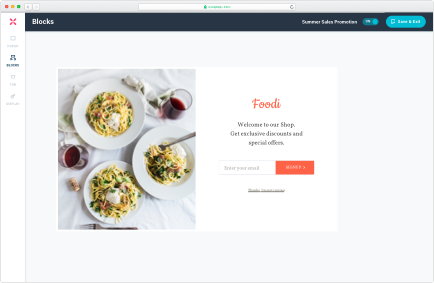 Because they can display a large popup with an enticing discount for users who are less familiar with their brand…and display a more subtle popup for users who have already visited the website and seen the first popup. 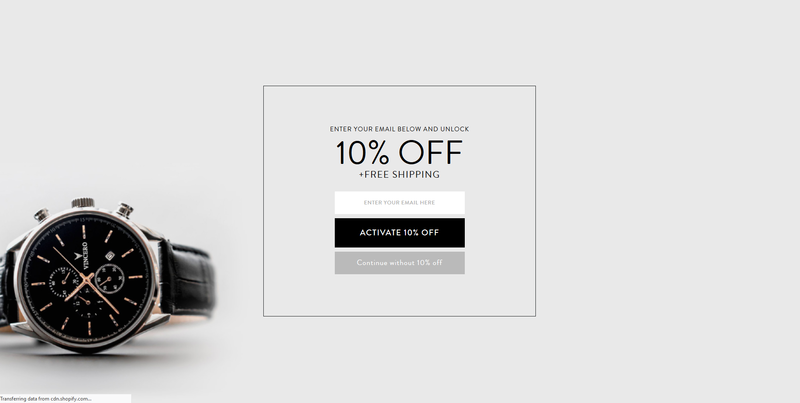 Here’s an example on Bonobos where the email subscription popup targets new visitors. AB test your popup timing. If you don’t have time for an AB test, create an exit popup. Segment your campaigns by page or browsing history. Set up in minutes. Free 14-day trial. No cc required. How do you react when you see a popup yourself? Do you rush to subscribe? Chances are you don’t, and you usually weigh in the pros and cons of giving away your email address. This is where your offer comes in. Let’s see what the best offers are. Let’s save some time here. According to our tests, coupons are THE most efficient way to convince your visitors to subscribe. Period. By adding a $7 coupon, our client was able to capture four times more emails than without a discount. But discounts are not the only option when it comes to coupons. 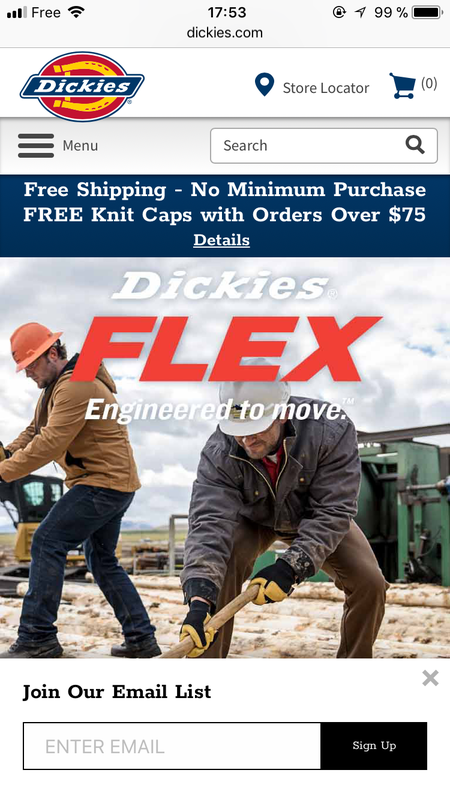 Free shipping offers work great as well. According to a poll by Retention Science, 21.8% of US retailers judge them to be the most effective kind of offer. If you have a budget for coupons, go for them. If not, we have more options for you. Sweepstakes are the second highest-converting offers we’ve seen. Their advantage? They’re usually cheaper and often work as well as discounts. 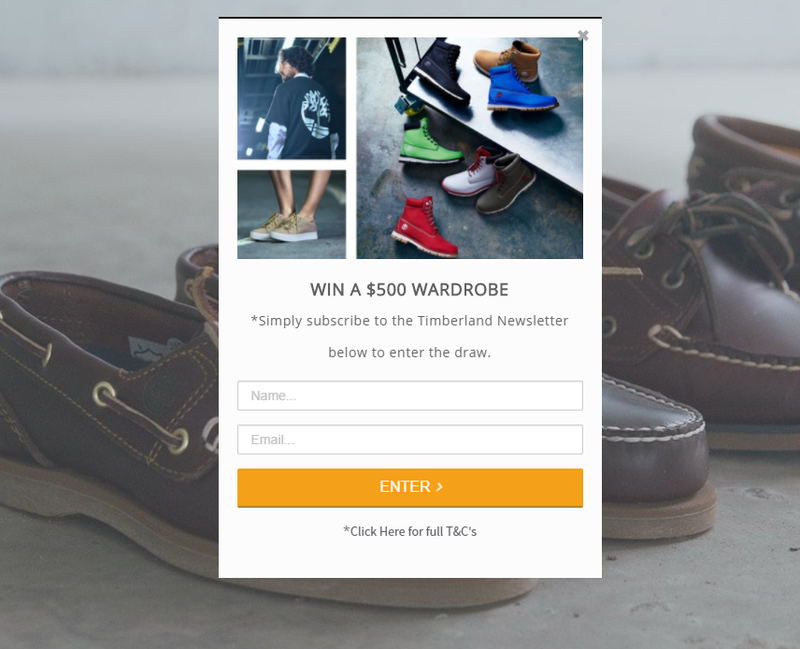 One of our clients, a major shoe retailer, is running both “regular” popup campaigns with no offer alongside sweepstakes popup campaigns. Guess what? His sweepstakes campaigns generate three times more subscribers than his regular campaigns! Sometimes, offering exclusive content such as an ebook can be more valuable than a coupon or a gift. That’s especially true for B2B and SaaS companies. More about this option here. This strategy may seem weird, but it worked so well for some of our customers that I wanted to share it. One of these clients is PixelMe. They tried this offer one month after launching their pixel retargeting solution. Their opening rate is very impressive as well: more than 60% opened the email sent once they subscribed. Sometimes, subscribers are not that hard to convince, especially if you have a strong brand or a reputation for sending great content. 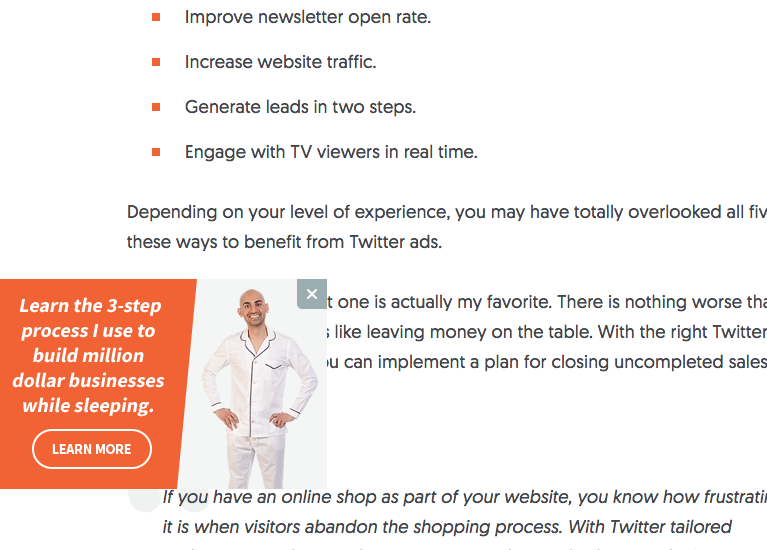 Here’s an example from Neil Patel’s website. See? No coupon, no freebie, no discount. Just the promise to receive valuable advice. Here’s a second example coming from Volusion. When possible, give away discount codes or offer a chance to win something. 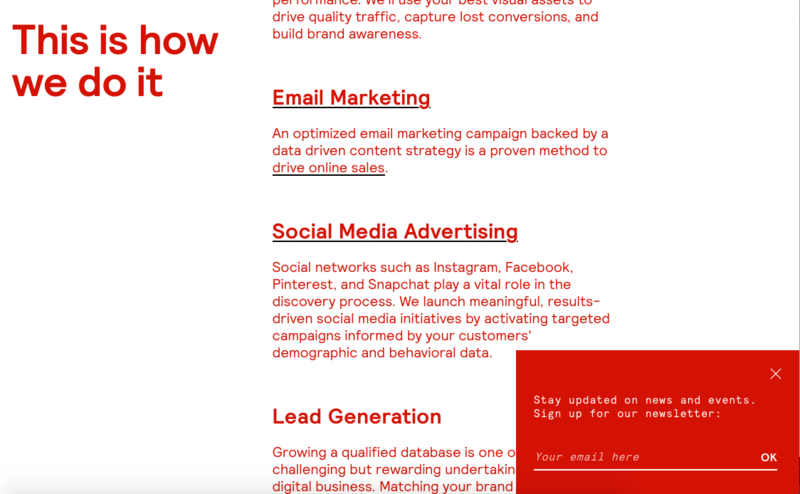 If you can’t, think hard about the kind of content that can help your newsletter stand out. Now that we’ve talked about your targeting and your offer, it’s time to focus on your popup wording. Let’s start with the body of your popup. This text is key to attracting your users’ attention and triggering their motivation to subscribe. Humor works great to shake your visitors and convince them to join you. A fun popup announces fun content…Here’s an example on Lush. Everyone likes to be part of a club, to feel special. How about playing on that for your popup? FOMO can help you convince your visitors to sign up immediately.No one ever wants to miss out on something they could have had! 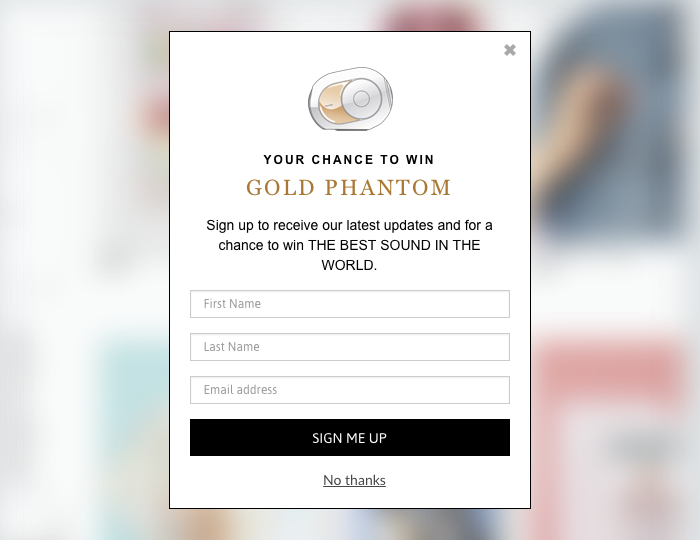 The call-to-action is the other half of your popup copy. Choose your editorial angle carefully; you won’t have a second chance. For your calls-to-action, choose a word that compels visitors to act. Designing your popup is the last step of the process. Let’s see how you can design the most convincing popup. What size should your popup be? 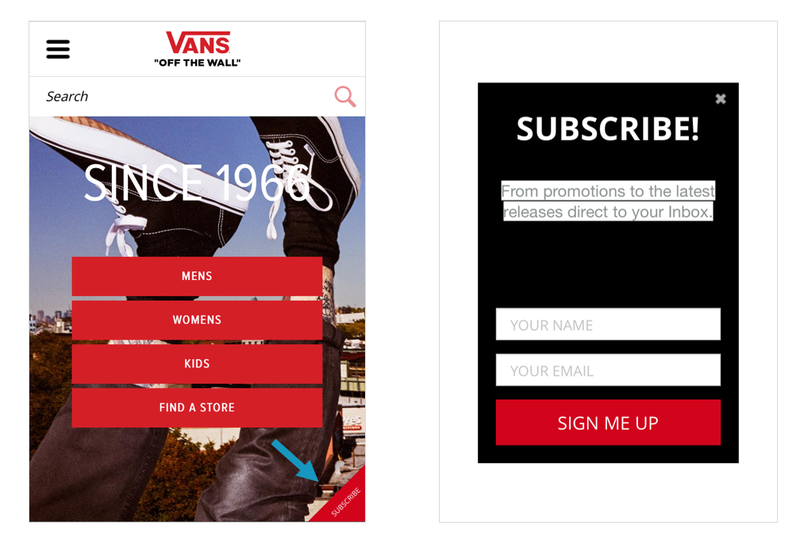 Let’s start with the simplest case: mobile popups. Google has shared precise guidelines on the matter. If you want to avoid an SEO penalty, your popup shouldn’t prevent your visitors from accessing the main content of the page. In other words, it shouldn’t be too large. See? Their banner is set to full width and its height is less than 250 pixels. That’s the size we recommend. If you want more freedom, you can also add a trigger before your popup; this allows you to respect Google guidelines yet design a larger popup. On desktop, the situation is different. You’re free to choose your popup size. As a rule of thumb, we recommend designing full-screen popups only when your popup is triggered on exit. Otherwise, you risk increasing your bounce rate. Now that you have picked a size, we can discuss visuals. Let’s see how you can leverage these benefits. Again, mobile is very specific. As bandwidth and space are limited, we recommend avoiding visuals or sticking to small visuals. Using a product visual is particularly popular in ecommerce. It reminds the visitor of your brand mission while contributing to make your popup more appealing. Using a picture of yourself can reassure your potential subscribers. To put it another way, you’re telling them, “We’re starting a discussion.” It works especially well for B2B websites and bloggers. Depending on the offer you make for your subscribers (we’ll elaborate later in this article), it might be worth illustrating it directly into your popup. 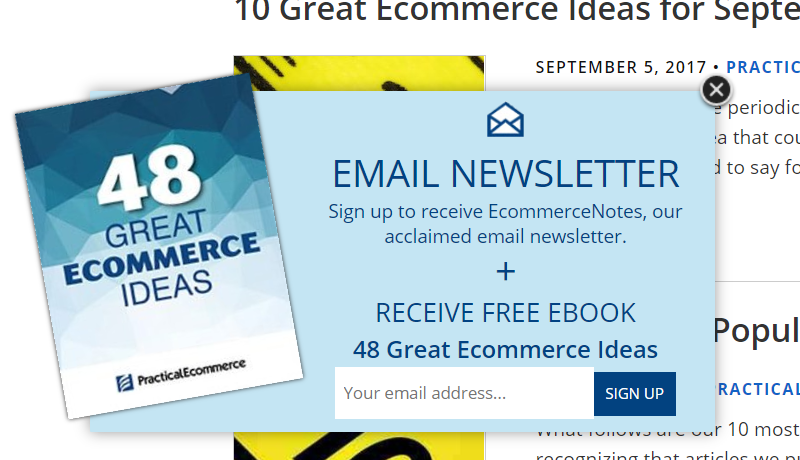 See this popup from Practical Ecommerce? It tells you right away what you’ll get when you subscribe. Logos are great to provide social proof and to reassure. Here’s an example on Conversioner.com’s email lightbox. No click, no email. It’s that simple. This is why you need to pay attention to your CTA design. Studies have shown that there’s no universal rule for CTA colors. They must be coordinated with your popup and website. Here’s a good example on Weebly. The CTA is white and stands out from the rest of the popup. Anything which can help your call-to-action be noticed can help. Bigger is not necessarily better. But make sure your CTA can’t be missed. If you’re having doubts, don’t hesitate to run an AB test. 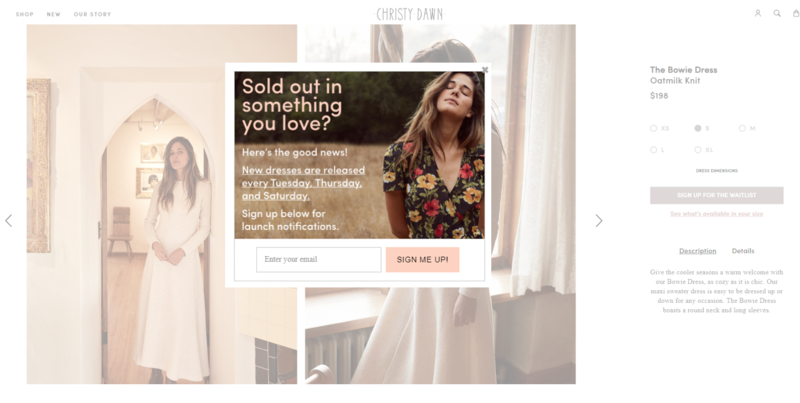 Here’s an example of large calls-to-action on Vincero Collective. The CTAs are as large as the email field itself. Create a different popup for each device type. Use visuals for desktop campaigns. Make sure your calls-to-action are unmissable. 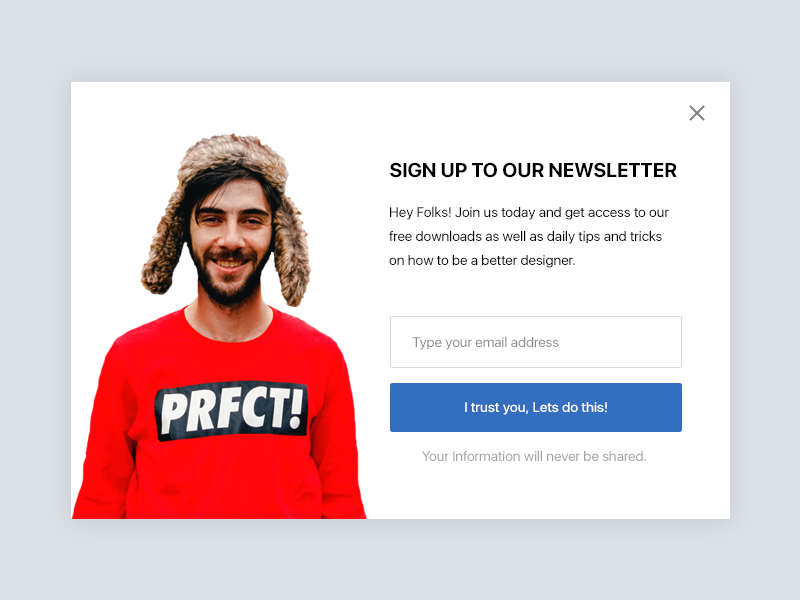 Ready to design your email popup? 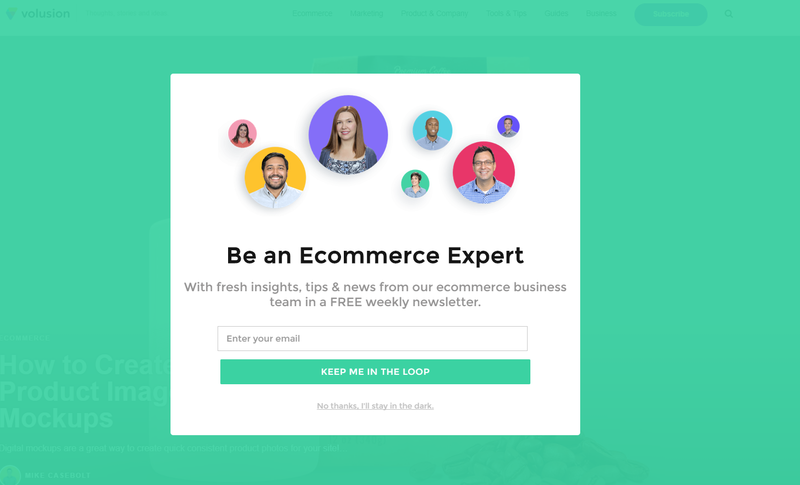 Check this gallery of email popup examples for inspiration. Try WisePops free now 14-day free trial. No credit card needed.